The relationship of God and the church and the relationship of spirit-filled spouses in marriage are the two great love relationships. 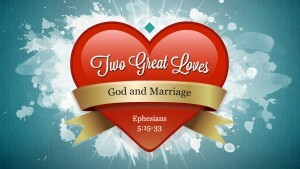 Marriage illustrates and makes known the mysterious relationship between God and us. The marriage of a man and woman is meant to illustrate great truths about Jesus and us—God in relationship with his church. From Genesis 2, we learn that Adam was created and placed in the garden alone. God said, “It is not good that the man should be alone; I will make him a helper fit for him.” (Genesis 2:18). God formed all the animals and birds and brought them before Adam. He named each of them, but there was not found a helper fit for him (Genesis 2:20b). Unlike any other part of creation, a man and woman relate to one another uniquely. The marriage relationship began with sharing and is lived out with sharing life and purpose. Adam shared with Eve his life and relationship with God and his purpose as a manager and cultivator of creation; Eve shared her life with Adam as his helpmate. Adam needed another person with whom to share his life with God—life in relationship with God and the life assignment from God. This reveals the mystery of Jesus, the Son of God, who shares life and purpose with us. No one other that Jesus would be able to share with us a life with God—a life in a holy relationship with God and with the eternally significant purposes of God. Both husbands and wives are to submit to one another out of reverence for Christ. In this way, marriage is a life of sharing, illustrating the Lord’s relationship with us. Our marriages are to be lived before others in such a way that people understand the gospel more fully. Marriage is seeking pleasure and joy for your spouse. Marriage is often viewed as an alliance for promoting personal well-being and satisfaction rather than a lifelong commitment to mutual love and service for the joy and pleasure of the spouse. Marriage is an orchestration of differences for harmonious beauty. God made Eve from Adam; making them alike in flesh and bone, but different in many other ways. It is in the vast differences between a husband and wife that they have the greatest opportunity to be beautifully orchestrated in life and purpose. Purposefully diverse, your marriage can bring a depth and beauty to life that moves people to discover more of the glory of God. Diversity alone can be divisive; diversity understood and purposefully embraced for harmonization can be uniting and beautiful. Marriage is only as fulfilling as you are filled with the Holy Spirit. Ephesians has given great insights to marriage relationships and a few others too, but they are all contingent on a foundational command—Be filled with the Spirit (Ephesians 5:18b). Imagine your marriage flourishing with grace, filled with unconditional love, lived with joy and peace. It will be for those who are filled with the Holy Spirit. Being filled with the Holy Spirit will make your ordinary relationships amazing and glorious.